BioCare Bio Acidophilus Forte is a unique high strength probiotic blend in capsule form. Bio-Acidophilus Forte contains the unique LAB4 complex of probiotic bacteria. This complex consists of two proprietary strains of Lactobacillus acidophilus and two proprietary strains of Bifidobacteria bifidum. LAB4 strains are human strain and acid-stable, and available only from BioCare. LAB4 has been tested extensively and has proven efficacy. Lactobacillus acidophilus and Bifidobacteria bifidum are viable, beneficial intestinal bacteria that naturally exist together in the gastrointestinal tract. These organisms have been shown to colonise the human intestinal tract and help maintain the health of the digestive system. Vacuum packed and microencapsulated to maintain the stability of these fragile organisms. This is part of the Informed Sports Approved Product Range from BioCare. The Informed-Sport programme allows athletes and those involved in sport to choose products that are rigorously tested, batch by batch, for WADA (World Anti-Doping Agency) banned substances to ensure that they are safer to use. 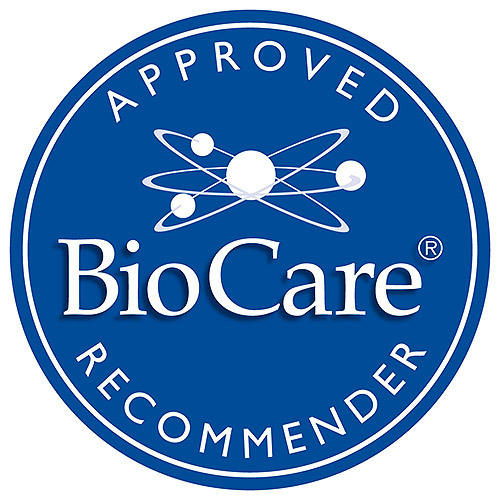 BioCare® has tested four important supplements (One a Day Vitamins & Minerals, Glucosamine HCL, Vitamin C 1000 and Bio Acidophilus Forte) for these banned substances and have been accredited with the Informed-Sport Logo. Lactobacillus acidophilus, Capsule Shell (Hydroxypropyl Methylcellulose), Fructooligosaccharides (Cichorium intybus Root), Bulking Agent (Cellulose), Anti-caking Agents (Silicon Dioxide and Magnesium Stearate), Bifidobacterium bifidum & Bifidobacterium lactis. Refrigerate below 4°C and avoid direct sunlight and heat. 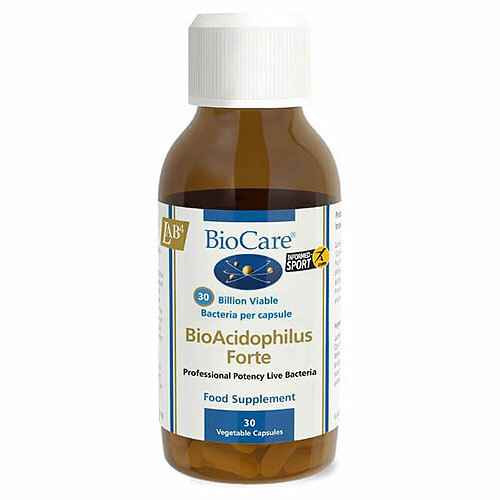 Below are reviews of Bio Acidophilus Forte - F.O.S. - 30 Vegicaps by bodykind customers. If you have tried this product we'd love to hear what you think so please leave a review. Have been taking these for a while, my digestion is so much more settled No bloating or sick feelings. Great product. Helps with my IBS and swollen bloated belly. I am also trying to lose weight so am eating a great deal of veg and these tablets help my digestion. This is my 3rd bottle of 60, wouldn't do without them now. Excellent! Works very well for me. I had a problem with swollen, bloated belly - always after eating. Two weeks after taking those tablets I'm not feeling like a balloon anymore. Of course I'm trying to keep good healthy diet as well which helps a lot. I highly recommend this product and I already bought the second bottle of similar product - BioAcidophilus 10 Billion. BioCare Bio Acidophilus Forte contains the unique LAB4 complex of probiotic bacteria. This complex consists of two proprietary strains of Lactobacillus acidophilus and two proprietary strains of Bifidobacteria; bifidum and lactis.